Chevrolet Camaro review | What Car? What is it? The Chevrolet Camaro is one of America's favourite sports cars, but it never really took off in the UK and hasn't been sold here for the past 10 years. 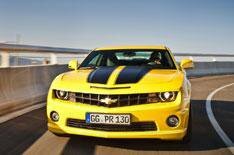 However, the company is once again importing its sharp-looking muscle car to the UK. The question is, should you consider one? What is it like to drive? To deliver maximum muscle-car thrills, the Camaro comes with a 6.2-litre V8 under the bonnet, which delivers 426bhp and 420lb ft of Tarmac-twisting torque. Fire it up, and the loud, throaty burble it gives promises rip-snorting performance. Thing is, it never really delivers in the way you expect it to. Sure, the mammoth torque means it'll pull sixth gear at stupidly low speeds, and the 0-62mph time of 5.2 seconds means it's certainly not slow. However, you have to really work the engine to get the best out of it, and even when you do, the forward thrust you feel isn't quite as devastating as you'd like. The car we drove had a manual gearbox, which really didn't help the Camaro's case. The shift is so clunky and vague that you often find yourself selecting entirely the wrong ratio, which hinders your progress even further. It doesn't deliver in the bends, either. Throw the car into a corner and the body control is actually quite tight once you get past a certain point. Before you get there, the body slopes sideways in a fairly dramatic manner, and it's really off-putting. The steering doesn't help, because it's too light and woefully vague, which makes the car even more difficult to place on the road. You're always aware of the Camaro's size, too, particularly its width, and so you're further discouraged from pushing on. The poor handling wouldn't be such an issue if the Camaro was a comfortable way to travel, but it feels decidedly uncivilised. There's a knobbly quality to the ride at all speeds, yet the body still feels unnervingly floaty over crests and dips in the road. On the motorway and you'll find that wind and road noise are surprisingly well contained. However, the sound of the V8 doesn't die down enough it sounds brilliant when you're working it hard, but drones irritatingly at 70mph. What's it like inside? There's enough space and adjustment for those in the front to get comfortable but, as in many coupes of this type, those in the back aren't so well catered for. There's just about enough legroom for a pair of average-sized adults, but limited headroom means they won't travel comfortably. The boot is a pretty good size at 384 litres, but the tight access and huge load lip mean that getting bulky items in will be difficult, if not impossible. American cars aren't famed for their cabin quality, and the Camaro shows you why. Many of the materials used would disappoint in a car costing half as much, and there's little finesse to the way in which the switchgear works. The switches are messily arranged, too, so operating some of the functions relies on trial and error. Should I buy one? The Camaro coupe starts at 34,995, which puts it in an interesting position. It's pricier than the less powerful Nissan 370Z, but thousands cheaper than the similarly powered Vauxhall VXR8. To our eye, the Camaro looks farbetter than both, and if those chiselled looks and muscle-car image are what you want, you'll buy one no matter what we say. However, running costs won't be so reasonable. To get the claimed 20.0mpg average, you'll have to drive it in a way that completely voids the reason for buying it in the first place, and the CO2 output is similarly scary at 329g/km. We have a bigger problem with the Camaro, though. To enjoy it, you'll have to forgive a vast number of fundamental shortcomings, and we don't think that's good enough these days. There are lots of other four-seat coupes (the Audi TTS and BMW 330i Coupe, for example) that'll give you more thrills and as strong an image for similar cash.